This is the perfect river journey to enjoy at a leisurely pace, giving you plenty of time to soak up the surroundings and stop for lunch. This trip blends rural countryside with Bedford’s stunning and historic Victorian Embankment, finishing in the beautiful nature reserve. You start at Kempston and paddle downstream through picturesque river meadows with lots of wildlife to see. The gentle flow will take you towards Bedford town centre with its tree-lined Victorian embankment and promenade. You pass under several historic bridges. 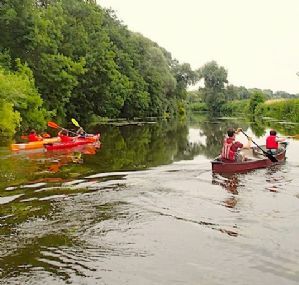 You will then portage (carry your boat from the higher river to lower river), allowing you time to stretch your legs before paddling back into the countryside for the final leg of your trip.